Adrenal Rush V2 is one of the best energy-based pre workout supplements without DMAA or DMHA from the studs at Primeval Labs! 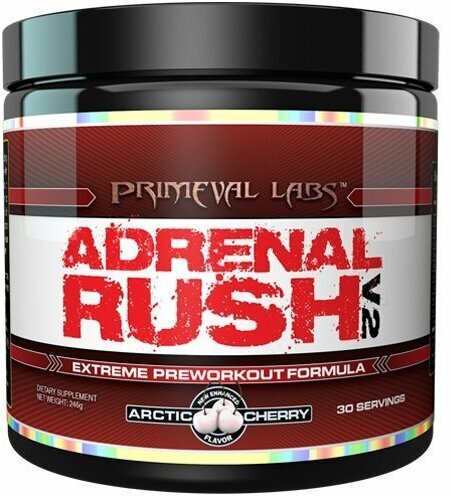 Primeval Labs is back with Adrenal Rush V2. This is their number 1 extreme pre workout formula for a reason, it works! With it's cutting edge ingredients, this pre workout supplement promises results after just the first scoop. You will feel stronger and more power at the very first workout. And with the nitric oxide boosting ingredients, you are going to get an insane pump and incredible vascularity in the gym and out. Through your entire workout, you will feel a rush energy and razor sharp focus. Every workout with be a progression to your goals. This formula is led by stimulants such as AdvantraZ, Hordenine, and Higenamine HCL as well as Caffeine Anhydrous. Other keys to this formula come from the powerful beta-alanine and Agmatine Sulfate. This is unlike any other pre workout currently on the market. Designed with a very specific, clinically dosed, set of stimulants and pump inducers this product will work each and every time, never giving you that stimulant tolerance feeling you get with other pre workouts. You will not find yourself needing 2,3, or even 4 scoops over time this pre workout will work with just 1 scoop each and every time. What has changed? Primeval Labs listened to their customers feedback, they understood everyone said man this is the best working pre workout on the market but the flavoring system needs work. They went back to the drawing board and got it right. You now have the same great product but improved flavoring not to mention new flavors! Primeval Labs is back with Adrenal Rush V2. 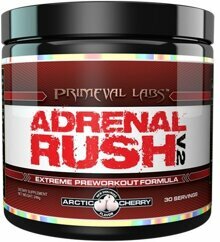 Primeval Labs is back with Adrenal Rush V2. What has changed? What has changed? A supplement company finally got it right, extremely effective pre workout with a great taste!